CAN YOU IMAGINE – JUST FOR AMOMENT! ESAYAS SABOTAGE ALGERIA AGREEMENTTO DEMARCATE OUR BOUNDARY, BETRAYED OUR MARTYRS IN BADEME AND BURI, RULED OUR PEOPLE BY HUNGER, FEAR, SHATTERED OUR YOUTH’S FUTURE, DESTROYED AND BURIED THE ERITREAN PRIDE. ABOVE ALL, OUR PORTS ARE GIVEN TO CONTRACTORS IN EXCHANGE DOLLARS. AND NOW, THE ASMARA UNIVERSITY BUILDING IS ON SALE. ACTION IS REQUIRED. WORDS ALONE CAN NOT SOLVE OUR PROBLEMS. IF WE DID ONE SIMPLE THING ” UNITY.” ENOUGH IS ENOUGH! ALREADY ENOUGH. OUR ERITREAN INDEPENDENT IS UNDER ATTACK BY DAY TIME HAYNES ESAYAS, ABIY AND LEMMA MEDEMER NEW POLILTICAL GROUP PASTORES PREACHING PEACE, LOVE AND FORGIVENESS FOR ETHIOPIANs NOT FOR ERITREANS. WE NEED TO STAND TOGETHER UNIFIED THAN EVER BEFORE. ኣምላኽ ናይ ዕድመ ጸጋ ክህበካ ከሎ ዓመት ድሕሪ ዓመት ክትልብም ይግበኣካ ‘ምበር ከም ሽንቲ ገመል ንድሕሪት? Do you mean like a hero BERHANE ABREHE? Bebihade kiharden endiu gin nikulen bhade teziharden xibuk eyu. Kulu bhade zena mikonelna etom hazen bexahtiwin hade mealti tirah kabsirah. Mibokeru. 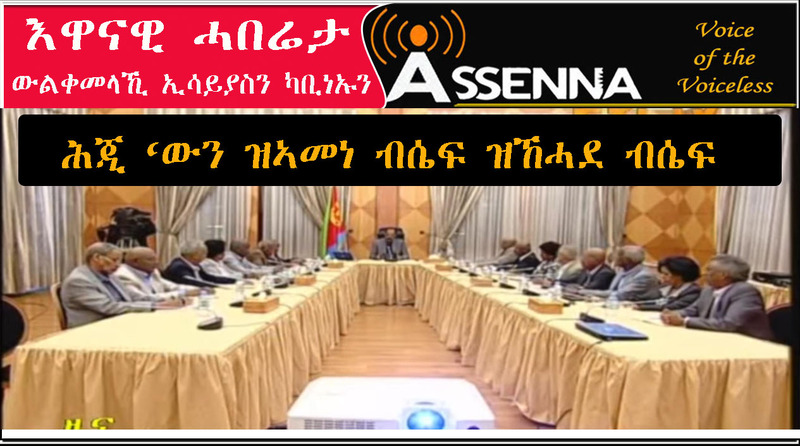 Isayas is looking for people who are/will oppose his action and working to apply his dictator man’s decision to sell and lease Eritrea to Ethiopia. Period, It is not about other officials corruption! Be aware Eritreans, we have to wake up and bring Isayas’s rein to end, end one man rule once and forever, enough is enough! This is the time to fasten our belt and stand together against Isayas conspiracy against Eritrean nationalism. HIS HIDDEN AGENDA IS NOT THAT SECRET, IT IS Wide Open! Eritrean Defense forces, Leaders, and all nationals stand together to stop as one our inner enemy uprooted from his source! The cart before the horse! He want’s to explain and give directives after the Declaration, and after signing and enjoying honeymoon trips to Addis, Jeda, Dubai etc! The same way Ibrahim sold Asab to Italians! Eritreans, we have paid for independence our beloved nationals, our blood, sweat and tears. Isayas is one man we should not allow him make us miserable, again and again, don’t allow him be above the law and the people, don’t let him bargain Eritrean sovereignty and freedom to gain his dreams, interests and ranks, to play play his dirty games against Eritreans.. Isayas has to be overthrown, be subjected for treason, and stand infront of Eritrean High/Supreme Court, and all Eritrean be given the chance to watch his sentence, for all his betrayals and crimes. History is on the making for good and bad! All his followers, Nihna NSU/ Isu. Count your days! ዝከበርካ ኣማኑኤል ኢያሱ ……ገለ ካብቲ ዝጽሕፎ ርእይቶ ኣይወጽን ኣሎ ሰለምንታይ? Because it game over for you girl!!!!! No more Nihna Nsu KKKKKKKK.